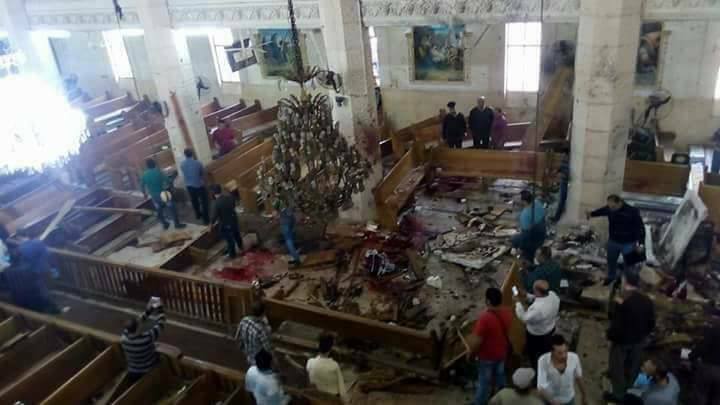 Egypt’s Christians are in mourning and profound shock after yesterday’s twin suicide bombing attacks on churches packed for Palm Sunday, which left at least 49 people dead and more than 110 injured. The Coptic Pope, Tawadros II, narrowly escaped injury, having just celebrated Mass in one of the cathedrals that was targeted. Pope Tawadros told local television that “sinful acts will not undermine the unity and coherence of the Egyptian people in the face of terrorism”. The bombing in St. George’s Cathedral in the Nile Delta city of Tanta, 60 miles north of Cairo, killed at least 25 and injured at least 78, the state-run news agency, Al-Ahram, reported. A suicide bomber then blew himself up among worshippers leaving St. Mark’s Cathedral in Alexandria, where Pope Tawadros had just finished celebrating Mass. Eighteen worshippers and four police officers were killed, and 35 were injured. Egyptian President Abdel Fattah el-Sisi declared three days of nationwide mourning and said a three-month state of emergency would begin once legal and constitutional measures have been completed. Mr. Gamal said he believed the Bishop of Tanta, Paula, was targeted but escaped death because he was not the celebrant at yesterday’s Mass. However, “the blast destroyed his chair by the altar”. Video footage shows a robed male choir intoning the Gospel reading – Christ’s triumphal entry into Jerusalem – in the moments before the explosion, when the picture cuts out and shouting and screaming can be heard. Most victims were men and many were deacons because the suicide bomber detonated his vest near to the pews in which the men sit. Mobile phone footage from the moments after the blast shows palm fronds in pools of blood, the floor of the church spattered with in blood, dust and masonry, and the decapitated body of one of the dead being carried out on a stretcher. One woman is heard screaming hysterically, while other members of the congregation move pews to get to the injured. 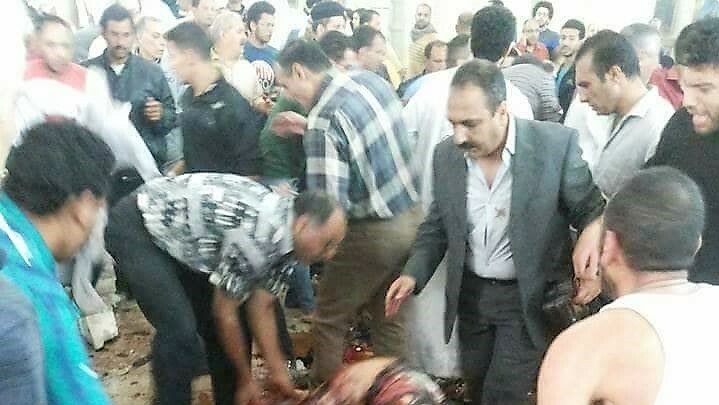 Meanwhile, in Alexandria, eyewitnesses said the suicide bomber tried to enter the church as worshippers were leaving. A member of the congregation, Mina Makram, said one of the cathedral’s guards, a man named Nasim, “stopped him, prevented him from entering the cathedral, and asked him to pass through a metal detector first. The man entered the detector briefly, then took a step back and exploded the suicide vest he was wearing under his jacket.” Three police officers, two men and a woman, also lost their lives preventing the bomber from entering the church. Mr. Makram said Nasim’s actions had saved many lives, including that of Pope Tawadros, at whom he said he believed the attack was aimed. “Pope Tawadros was targeted to be killed … If this suicide bomber had been able to enter the church, the number of the victims would have been more,” he said. The attacks raise questions again about security in Egypt’s churches and the government’s commitment to safeguarding its non-Muslim citizens. A priest at St. George’s Cathedral said they pointed to “a security defect”. Bishop Angaelos, General Bishop of the Coptic Orthodox Church in the UK, lamented “the senseless and heartless brutality that can lead a person or people to indiscriminately take innocent lives, especially at the most vulnerable hour of prayer”. Pope Francis, who is due to visit Egypt at the end of April, received word of the attack in Tanta while celebrating Mass in St. Peter’s Square yesterday. “I pray for the dead and the victims. May the Lord convert the hearts of people who sow terror, violence and death and even the hearts of those who produce and traffic in weapons,” he said in hastily prepared comments at the end. Grand Sheikh Ahmed el-Tayeb, head of Egypt’s Al-Azhar University, the seat of Sunni learning, said it was a “despicable terrorist bombing that targeted the lives of innocents”. The World Council of Churches condemned the attack and urged President Sisi “to act swiftly and boldly to safeguard the fundamental religious rights of worshippers of all faiths, to ensure security in the face of violence and to guarantee justice for all people”. One commentator urged Francis to cancel his trip, not only for his safety but also to ensure he would not boost the legitimacy of President Sisi. Rania Elmalky, former editor-in-chief of the Cairo-based Daily News Egypt, wrote on the Middle East Eye website that Egypt’s “ignominious record of church bombings”, as well as a “massacre” of political opponents, has been followed by “no legal path to justice, no closure for the families of victims, but lots of tempestuous speeches about religious unity and the need to eradicate terrorism”. A local Christian known as “Nehemiah”, who works to support Christians under pressure for their faith in Egypt, told World Watch Monitor he feared some Christians would be too scared to attend the daily church services that will take place throughout the rest of Holy Week. He added: “One of the most joyful days for Christians in Egypt is Palm Sunday. 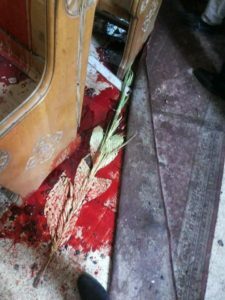 To prepare for that day, parents buy palm leaves for children the day before and weave them together and decorate them with spring roses, so that children can carry them happily the next day to church and place them near the pulpit… But that joyful day turned into a painful tragedy.